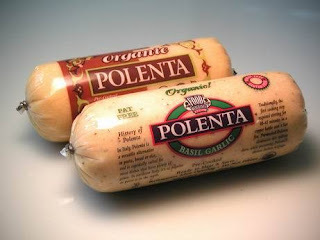 The Vegan Edge with Stacy Alexander: Polenta time! Polenta has become a favorite staple in my diet because of its versatility as well as its ease in preparation. It can be served soft, hard, grilled or fried. It can be topped with a myriad of sauces and vegetables and can have various ingredients folded in while it's still soft. Italians often spice-up their polenta by substituting water with broth. It is easy to make from scratch, but I find the Trader Joe's pre-packaged polenta is great. It has all-natural ingredients and is packaged similarly to sausage in a plastic "tube" sort of thing. This form of polenta is a little on the firm side, which I enjoy, and can be sliced into individual medallions. My favorite way to cook this type of polenta is to layer it in a baking dish with fresh basil and my favorite vegan red sauce and sauteed mushrooms. Heat it through in a 375 oven for about 30 minutes and a tasty treat ensues. Not quite vegan? Add a high quality parm/reggiano and you have one delicious entree! A good polenta dish with a Mexican twist can be made by layering it with chili or black beans, sauteed onions, salsa and cheese, if you're not a vegan, or vegan cheese sauce if you are. Refrigerate overnight and allow it to chill until firm.